It rarely happens, but Scott Sumner and I do sometimes disagree on something. Not surprisingly this time it is on a (mostly) non-monetary matter – the long-term outlook for the Chinese economy. I have several problems with this argument. First, if Lars really feels PPP is wrong, and that we should use nominal figures, then he should not be talking about China having recently grown at 7 to 7.5% per year. In PPP terms China may have been growing at 7.5% vs. 2% in the US, but in nominal terms the gap is far wider, due to the Balassa-Samuelson effect. China’s real exchange rate has appreciated strongly over the past decade. So if Lars is right that nominal exchange rates are the right test, then China’s been catching up to the US at a rate far faster than either Lars or I assume. And in that case China’s nominal growth could slow dramatically and yet still be growing far faster than the US (where trend NGDP growth is now about 3%, in my view.) Lars avoids this problem by assuming the Balassa-Samuelson effect will suddenly come to a screeching halt, whereas I think the yuan is headed to 4 to the dollar. He also assumes a 3% RGDP growth rate for the US, whereas I believe it will be closer to 1.2%, growing over time to perhaps 2% in a few decades. Other than it is a bit paradoxical that Scott aka Mr. NGDP is so eager to dismiss using nominal terms rather than real terms when it comes to comparing the absolute size of an economy the real disagreement comes down to whether there is a Balassa-Samuelson effect or not. According to the the BS effect relatively poorer countries – such as China – will see its exchange rate appreciate in real terms relative to richer countries such as the US. In my China-post I assumed that there was no BS effect – and that the relative exchange rate between China and the US in the future would be determined by the Purchasing Power Parity (PPP). This assumption of course means that there is no difference whether we use real or nominal growth rates in GDP when comparing the relative size of the Chinese and the US economy (both measured in US dollars). I acknowledged in my post that my no-BS effect assumption was a bit brave and I would happily agree that there is nothing theoretically wrong with the Balassa-Samuelson effect. However, I would also say that having worked professionally with forecasting Emerging Markets currencies for nearly 15 years I would be extremely skeptical about its importance of it from an empirical perspective. I will return to that below. Scott often argues that the markets is the best thing we have to predict the future. I strongly agree with that. Despite of that Scott makes a bold prediction on the outlook for the Chinese renminbi. Hence, Scott not only predicts a real appreciation of the renminbi, but he also argues “I think the yuan is headed to 4 to the dollar” – hence significant nominal appreciation. That is an extremely bold prediction given USD/CNY today is trading around 6.15. Said in another way Scott is basically predicting a 50% appreciation of the renminbi! This is in direct contrast to what the markets are predicting. If we for example are looking at a 1-year forward for USD/CHY the market is now predicting around 2% depreciation of the renminbi. So we should ask Scott – do you believe markets are efficient or not? There is also another way to think about whether or not we will see a real Chinese appreciation or not in the coming decades and that is by looking at the experience of similar countries. China’s transition and its catching-up process is often compared to South Korea and Taiwan. Therefore, I have looked that the historical development in in the South Korean won and Taiwan dollar. I have chosen 1990 as my “reference year”. The reason is that at that time South Korea’s and Taiwan’s GDP/capita relative to the US were more or less where Chinese GDP/capita is today compared to the US. Lets first have a look at South Korea. The first thing we see it that PPP seems to have been a pretty good “predictor” of the long-term development in the won over the long-term. I have calculated PPP based on the relative development in the GDP deflators in South Korea and the US. But lets return to the question of real appreciation. 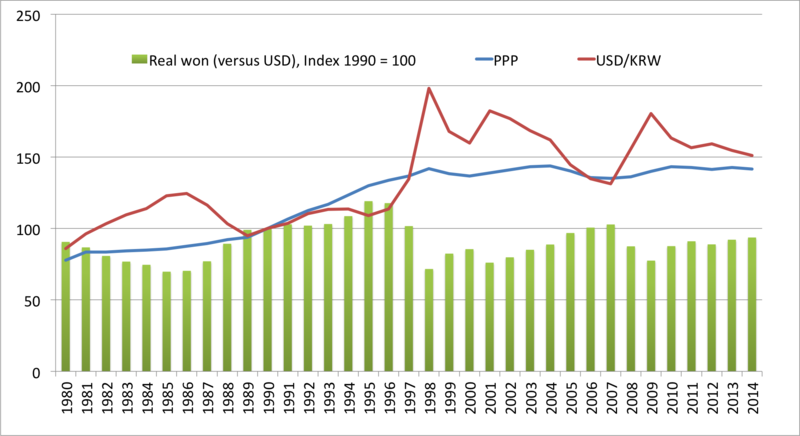 Has there been a real appreciation of the won (against the dollar) since 1990? The answer is NO. In fact there has been a slight depreciation of the won in real terms. But of course South Korea went through a major crisis in 1997 so it might be special. So lets instead look at Taiwan. Guess what? 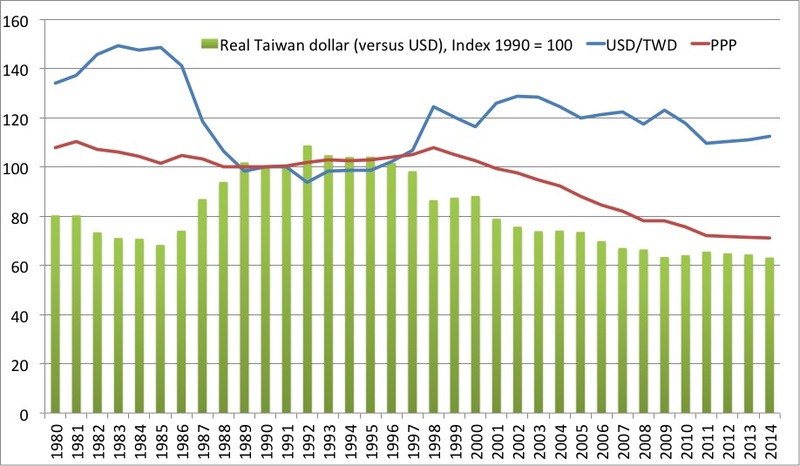 Since 1990 the Taiwan dollar has actually depreciated significantly in real terms against the US dollar. Maybe exactly because it has appreciated in the years ahead of 1990. No matter the reason both the Taiwanese and the South Korean experience tell us that real currency appreciation is no given or automatic part of the catching up process for economies like South Korea, Taiwan or China. The graph below shows that Scott’s claim is correct. But the graph also shows that the renminbi was more or less flat against the dollar in real terms from the early 1990s until 2005-6. Hence, we had at least 15 years of economic catch-up without any real appreciation of the CNY at all. Hence, again it is fair to argue that real appreciation does not automatically follow from economic catch-up. The period from 1990 to 2006 shows that quite clearly. Furthermore, we want to ask ourself whether the real appreciation over the past decade really is a result of economic transition and catching up or something else. Hence, it is quite clear that over this period the People’s Bank of China have tried to curb inflationary pressures by undertaking a managed strengthening of the renminbi against the dollar – both in nominal and real terms. That process might now be coming to an end as the Chinese economy has slowed rather dramatically and inflationary pressures clearly have eased as well – particularly since 2011-12. Finally let us again return to the examples of South Korea and Taiwan. The graph below shows the real exchanges of South Korea, Taiwan and China (against the US dollar). ‘Year zero’ is 1990 for South Korea and Taiwan, while ‘year zero’ is 2014 for China. Hence, the graph is “calibrated” so all three countries are at a similar income level versus the US in ‘year zero’. I think the graph is quite telling – the appreciation of the renminbi over the past decade has been fairly similar in size to the appreciation in the in won and the Taiwanese dollar in the decade ahead of 1990. However, as also illustrated above that real appreciation didn’t continue. 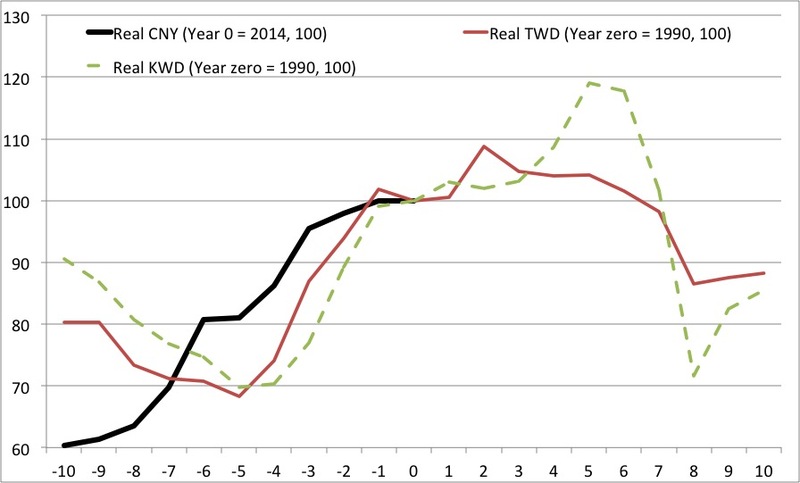 In fact a decade later both KRW and TWD had depreciated more than 10% in real terms against the US dollar. This of course is not a prediction for what will happen – it is just an illustration that based on the experience of Taiwan and South Korea there is no reason to expect continued real appreciation of the renminbi. So my message to Scott is – don’t bet on a real appreciation of the renminbi! PS Scott uses the term yuan and I here have used the term renminbi. Renminbi is the official name for the Chinese currency and yuan is the main unit of currency. Lars, Good post. Just to be clear, I am not predicting any yuan appreciation over the next year, my prediction is long term. Suppose North Korea set their exchange rate at a level that implied they had the largest economy in the world. Would that be your view? Probably not, it wouldn’t be a market rate. 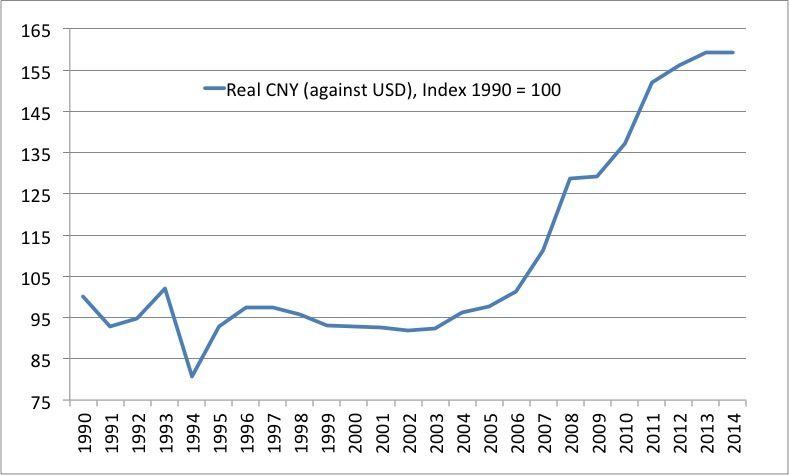 Well the movement in the yuan that you show on the graph for the 1990s was also not a market exchange rate. Interesting posts on China–but I am a little disappointed to see not even a paragraph on monetary policy. From my MM friends no less! If the US central bank (the Fed) chooses long-term monetary asphyxiation, while the PBoC chooses growth, we may in fact see China rise above the USA, in terms of GDP. We know that a central bank can suffocate an economy for a long time–see Japan, as in 20 years. See the ECB—how long until they give up? The Fed wil not let inflation rise above 1.5 percent. That may be asphyxiation. The PBoC is under control of the CCP. They want growth. They have a 4 percent inflation ceiling-target, which I think is pretty good. Oddly enough, a communist central bank might be better at central banking than an ideology-bound Western central bank. And the Fed has ossified. They are building a case for permanent monetary tightness. My real complaint is that MM’ers should hew to the MM perspective. Don’t get too excited about the PBOC, it is in a right old mess. They want to loosen monetary policy but the interest rate structure is impossibly distorted by state controls, despite promises of deregulation for years now. There are maximum and minimum rates on loans and deposits, and loan quotas that banks have to meet, no more, no less. The loan quotas are fulfilled at artificially low rates. But the banks will only lend these low rate forced loans to ultra-safe State-Owned Enterprises and other government related vehicles. Most safe SOEs don’t want the funds, and instead on-lend them through various channels (think Chinese Shadow Banking) to other areas that are short of funds, like construction. The PBOC doesn’t like a lot of the excess construction, so wants to rein it in – a sort of monetary tightening. And construction is weakening at the moment, so there is excess funds going nowhere as the PBOC is also under pressure to ease due to the weak state of construction that it has been party to engineering … and so forces more loans into the market, and the cycle attempts to repeat. Those at the back cry forward, those at the front cry retreat. It’s about where we are in China banking today. This certainly looks perspicacious today.